The North Country Self Storage Facility Manager, Eric Jallo, met Michael Owen, President of VETality Corp. last year in the process of choosing a local charity for the facility’s annual community giving donation. The NCSS team was so impressed with the organization that they decided to bestow their 2019 contribution to VETality once again. Michael and his fellow Marine brothers created VETality, a Non-Proﬁt Organization, with the intentions of reducing the negative statistics associated with Veterans today, such as unemployment, suicide, and drug abuse. They understand ﬁrsthand the struggles of transitioning military personnel and the obstacles they face upon discharge from the armed forces. VETality Corp. VETality aims to reintegrate U.S. military Veterans back into society through education, training and career networking. VETality works to reduce Veteran unemployment, provide transitional assistance prior to separation, reduce Veteran suicide and drug use by providing proactive measures for military service members prior to their end of service date. Upon entry to the program, VETality uses a custom made system that enables Veterans to choose a given pathway to potential employment. The program is designed to enable Veterans the ability to establish a foundation of tools and resources needed to sustain employment. Each Veteran is assessed and mentored through the program while working towards certiﬁcation, education and vocational rehabilitation. The program at VETality Corp. enriches the already valuable qualities Veterans possess and couples it with new skills learned in the program, creating a more polished, highly qualified Veteran suitable for potential civilian employment. 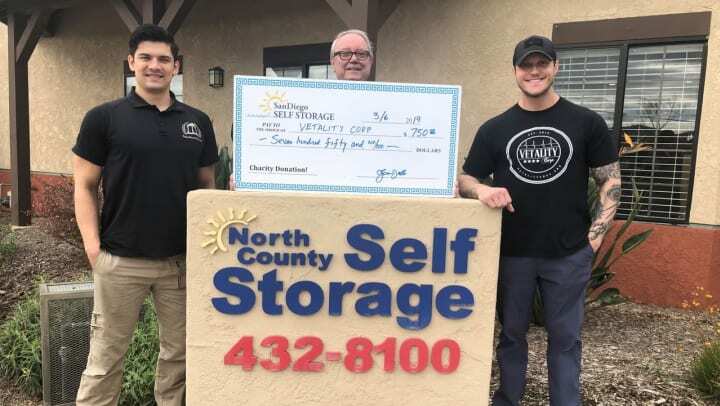 North County Self Storage is proud to support these efforts and the incredible work Michael and his team accomplishes on behalf of veterans. There is so much more to learn about all of the programs VETality offers - check out the website at: http://vetalitycorp.org.